Last night some friends and I decided to venture the Seattle International Film Festival, otherwise known as SIFF. I picked a movie that would be fun and quirky. While it won't make any international waves, Yes, I Can See Dead People is a surprisingly agreeable entry into the teen horror genre, featuring lots of scary little kids. 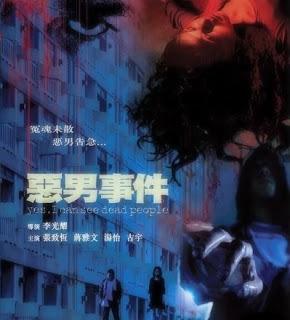 This Hong Kong dark comedy/horror flick starts off introducing its main character, Wah Koon-Nam, who is a slacker and spends most of his time delivering food, playing his PSP, and bumming around the public housing estate where he and his family reside. Oh, one other thing: Nam sees ghosts. No exclamation point, no registration of alarm; just the matter-of-fact acknowledgement that he can see the undead. Yes, I Can See Dead People won’t win any great cinematic awards, but for what it is - would-be cheesy teen horror - it's surprisingly effective. There were elements of comedy that had everyone laughing and delivered lots of decent tension and surprise. I found myself jumping quite a bit with in-your-face scare tactics. All the characters were very likable and the music, even though off-beat, was nicely placed which added to the film even more. It’s pretty obvious this film didn’t have a big budget, but the director, Lee Kwong-Ui, delivered nicely with his limitations. I will say that the movie lacked in its ending. I felt the flash backs came in too late for you to remember their purpose and the movie had about 4 too many would-be endings – it just kept going and going when it should have ended already. It made the film feel like it was 2 in ½ hours long when it was only 90 minutes. It just didn’t congeal well enough in the end making it a little too confusing not to mention a tad bit boring. But over all I enjoyed this film and like I said it was fun for what it was. Most of the time it kept you on your toes.